Douglas Aircraft developed the C-124 from 1947 to 1949, from a prototype they created from a World War II–design Douglas C-74 Globemaster, and based on lessons learned during the Berlin Airlift. The aircraft was powered by four large R-4360 piston engines producing 3,800 hp (2,800 kW) each. The C-124's design featured two large clamshell doors and a hydraulically actuated ramp in the nose as well as a cargo elevator under the aft fuselage. The C-124 was capable of carrying 68,500 lb (31,100 kg) of cargo, and the 77 ft (23 m) cargo bay featured two overhead hoists, each capable of lifting 8,000 lb (3,600 kg). As a cargo hauler, it could carry tanks, guns, trucks and other heavy equipment, while in its passenger-carrying role it could carry 200 fully equipped troops on its double decks or 127 litter patients and their attendants. It was the only aircraft of its time capable of transporting heavy equipment such as tanks and bulldozers without disassembling said equipment. Nose and front door of a C124. An early C-124A during the Korean War. The experimental YC-124B-DL powered by four Pratt & Whitney YT-34-P-6 turboprops. Prototype rebuilt from a C-74 with a new fuselage and powered by four 3,500 hp R-4360-39 engines, it was later re-engined and redesignated YC-124A. Prototype YC-124 re-engined with four 3,800 hp R-4360-35A engines. Douglas Model 1129A, production version with four 3,500 hp R-4360-20WA engines; 204 built, most retrofitted later with nose-radar and combustion heaters in wingtip fairings. Douglas Model 1182E was a turboprop variant of the C-124A with four Pratt & Whitney YT34-P-6 turboprops; originally proposed as a tanker, it was used for trials on the operation of turboprop aircraft. Douglas Model 1317, same as C-124A but with four 3,800 hp R-4360-63A engines, nose radar, wingtip combustion heaters and increased fuel capacity; 243 built. 23 March 1951: A C-124A 49-0244 flying from Loring to Mildenhall RAFB reported a fire in the cargo crates, signaling Mayday. They began jettisoning the crates and announced they were ditching. The C-124 ditched at approximately, 50°45′0″N 24°03′0″W﻿ / ﻿50.75000°N 24.05000°W﻿ / 50.75000; -24.05000﻿ (Airy Transit) 700 SW of Ireland. The aircraft was intact when it touched down on the ocean. All hands exited the aircraft wearing life preservers and climbed into the inflated 5-man life rafts. The rafts were equipped with cold-weather gear, food, water, flares, and Gibson Girl hand crank emergency radios. Shortly after the men were in the life rafts, a B-29 pilot out of Ireland spotted the rafts and the flares that the men had ignited. Their location was reported and the pilot left the scene when his fuel was getting low. No other United States or Allied planes or ships made it to the ditch site for over 19 hours, until Sunday, 25 March 1951. When the ships arrived all they found were some charred crates and a partially deflated life raft. Ships and planes continued searching for the next several days but not a single body was found. The men of C-124 #49-0244 had disappeared. There is circumstantial evidence that the airmen may have been "snatched" by the Soviet Union for their intelligence value, but their fate remains a mystery. See 1951 Atlantic C-124 disappearance. 22 November 1952: C-124A 51-0107 flying out of McChord Air Force Base in Washington state crashed into the Colony Glacier on Mount Garrett, 40 miles east of Anchorage, Alaska, killing all 41 passengers and 11 crew. Debris from the plane and remains of some of the victims were found by the Alaska National Guard on June 10, 2012 having apparently been uncovered due to the receding of the glacier. By 2014 remains of 17 victims had been recovered. 20 December 1952: C-124 50-0100 flying out of Moses Lake, Washington (Larson AFB) and taking airmen home to Texas for the holidays as part of "Operation Sleigh Ride" crashed not long after takeoff. A total of 87 airmen were killed. 18 June 1953: C-124 51-137 took off from Tachikawa Air Base in Japan. Shortly after takeoff, one of the engines failed, forcing the pilot to make an emergency landing. Due to a loss of airspeed, the pilot lost control and crashed into a melon patch, killing all seven crew and 122 passengers. At the time, it was the worst accident in aviation history. 6 April 1956: C-124 52-1078, crashed on takeoff from Travis AFB. Three of the seven crew members died in the crash. The cause of the crash was attributed to the crossing of the elevator control cables by maintenance personnel. 31 August 1957: C-124C 52-1021, operated by the 1st Strategic Squadron[N 1], crashed during an instrument approach to Biggs Air Force Base in El Paso, Texas, USA, in bad weather after a flight from Hunter AFB near Savannah, Georgia, USA. Five aircrew were killed, ten injured. 4 September 1957, C-124A 51-5173 en route from Larson AFB, Washington crashed while attempting a landing at Binghamton Airport, Binghamton, New York. The C-124A was delivering 20 tons of equipment for Link Aviation. The crew of nine survived. 27 March 1958: C-124C 52-0981 collided in midair with a USAF Fairchild C-119C Flying Boxcar, 49-0195, over farmland near Bridgeport, Texas, United States, killing all 15 on the Globemaster and all three on the Flying Boxcar. The two transports crossed paths over a VHF omnidirectional range (VOR) navigational radio beacon during cruise flight under instrument flight rules in low visibility. The C-124 was on a north-north-easterly heading flying at its properly assigned altitude of 7,000 ft (2,100 m); the C-119 was on a southeasterly heading, and the crew had been instructed to fly at 6,000 ft (1,800 m), but their aircraft was not flying at this altitude when the collision occurred. 16 October 1958: C-124C 52-1017 crashed into a 3200 feet mountain near Cape Hallett Bay, killing seven of the 13 on board. Navigational errors were made during this air-drop mission over Antarctica. 18 April 1960: C-124C 52-1062 crashed into a 450 ft (137 m) hillside after taking off in heavy fog from Stephenville-Harmon Air Force Base, Newfoundland and Labrador, Canada, killing all nine on board. 2 January 1964: C-124C 52–0968 flying from Wake Island Airfield to Hickam Air Force Base, Honolulu disappeared over the ocean, 1,200 km west of Hawaii. Eight crew and one passenger were lost in the accident. 22 January 1965: C-124 52-1058 crashed into mountains while on approach to Athens Airport. All ten passengers and crew were killed. 12 February 1966: C-124 52-0980 crashed into the 11,423-foot Pico Mulhacen in the Sierra Nevada mountains while on a flight from Morón Air Base to Murcia–San Javier Airport, Spain. 28 July 1968: C-124A 51-5178 flying from Paramaribo-Zanderij to Recife, while on approach to land at Recife, flew into a 1,890 ft high hill, 50 miles (80 km) away from Recife. The ten occupants died. 26 August 1970: C-124 52-1049 crashed on approach to Cold Bay Airport, all seven on board were killed. 3 May 1972: C-124 52-1055 crashed on approach to Johan Adolf Pengel International Airport, all 11 on board were killed. C-124C 52–1000 making its last landing at Travis Air Force Base, 10 June 1984. 52-0943 – C-124C on static display at the KAI Aerospace Museum in Sacheon, Yeongnam. 49-0258 – C-124A on static display at the Air Mobility Command Museum at Dover Air Force Base near Dover, Delaware. In July 2005, museum volunteers reattached the aircraft's wings and clamshell doors. It had previously been displayed at the Strategic Air Command Museum at Offutt Air Force Base, Nebraska since 1969. 51-0089 – C-124C on static display at the Museum of Aviation at Robins Air Force Base in Warner Robins, Georgia. 52-0994 – C-124C on static display at the McChord Air Museum at McChord Field in Lakewood, Washington. This aircraft was formerly under civilian registration N86599 and located for many years at the Detroit Institute of Aeronautics. On 9 October 1986 the aircraft was flown non-stop from Selfridge Air National Guard Base near Detroit, Michigan to McChord Field. While flying over Washington state the aircraft was joined by a Lockheed C-130 Hercules and Lockheed C-141 Starlifter of McChord's 62nd Military Airlift Wing. This is the last recorded flight of a C-124. 52-1000 – C-124C on static display at the Travis Air Force Base Heritage Center at Travis Air Force Base in Fairfield, California. The museum was given the C-124 in August 1982. The aircraft had been stored for many years outside at the Aberdeen Proving Ground in Aberdeen, Maryland where it was used as a storage shed. Transporting the aircraft by ground to California would have been prohibitively expensive so the decision was made to fly the aircraft to the museum. Volunteers joined with members of the Georgia Air National Guard's 116th Tactical Fighter Wing from Dobbins Air Force Base to restore the C-124 to an airworthy and ferryable condition. The aircraft was then ferried from Aberdeen to Dobbins AFB in Georgia where members of the 116 TFW completed the aircraft's restoration. The aircraft was then flown cross country to Norton Air Force Base in San Bernardino, California. After a photo session over the Golden Gate Bridge the C-124 arrived at the Jimmy Doolittle Air & Space Museum at exactly 1400 on 10 June 1984. This was the first recorded flight of a C-124 in nearly a decade. 52-1004 – C-124C on static display at the Pima Air and Space Museum in Tucson, Arizona. 52-1066 – C-124C on static display at the National Museum of the United States Air Force at Wright-Patterson Air Force Base in Dayton, Ohio. 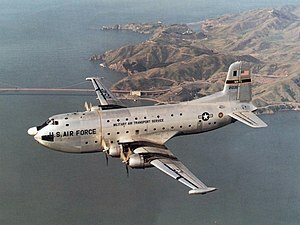 This was one of the last two Air National Guard C-124s retired in 1974. The aircraft is displayed with serial number 51-0135. 52-1072 – C-124C on static display at the airpark at Charleston Air Force Base in Charleston, South Carolina. 53-0050 – C-124C on static display at the Hill Aerospace Museum at Hill Air Force Base in Roy, Utah. In 1992, the aircraft was rescued from the Aberdeen Proving Ground in Maryland, which planned to use it for ballistics testing. Cockpit of C-124 on display at the McChord Air Museum, McChord AFB, WA. ^ Associated Press article does not give full squadron name, but it is likely that this refers to the 1st Strategic Support Squadron, as this unit operated the C-124 and was based at Biggs AFB. ^ "C-124C." McCord Air Museum. Retrieved 28 June 2011. ^ Baugher Joe. "USAF serials 1952." American Military Aircraft. Retrieved 3 October 2011. ^ Francillon 1979, p. 470. ^ Connors 2010, p. 294. ^ "Douglas C-124 Globemaster II Fact Sheet." Archived 5 December 2014 at the Wayback Machine National Museum of the United States Air Force. Retrieved 23 July 2011. ^ Walker Aviation Museum | The Wonder of Aviation – Past, Present and Future. Wafbmuseum.org (23 May 2013). Retrieved 17 October 2013. ^ Prime, John Andrew (26 March 2011) "Plane's 1951 disappearance still a mystery" Air Force Times. ^ "Alaska glacier wreckage is 1950s military plane". Yahoo! !News (27 June 2012). Retrieved 17 October 2013. ^ Ranter, Harro. "ASN Aircraft accident Douglas C-124A-DL Globemaster II 51-0107 Anchorage, AK". aviation-safety.net. Retrieved 9 July 2017. ^ "New technology aids recovery of Alaska plane wreck". phys.org. Retrieved 9 July 2017. ^ "Accident description 50-0100." Aviation Safety Network, 24 March 2008. Retrieved 3 October 2011. ^ "Accident description 51-0137. "Aviation Safety Network, 24 March 2008. Retrieved 3 October 2011. ^ Associated Press, "5 Airmen Die in Crash of Globemaster", The Dallas Morning News, Dallas, Texas, Sunday 1 September 1957, page 11. ^ "1952 USAF Serial Numbers". Joebaugher.com. Retrieved 28 June 2013. ^ Handte, Jerry. "Co-Pilot Tells How Plane Crashed." Binghamton Press, 5 September 1957, p. 1. ^ "Accident description 51-5173." Aviation Safety Network, 21 October 2006. Retrieved 3 October 2011. ^ "1949 USAF Serial Numbers". Joebaugher.com. Retrieved 25 June 2010. ^ Ranter, Harro. "ASN Aircraft accident Douglas C-124C Globemaster II 52-1017 Cape Hallett Bay". Flight Safety Foundation. Retrieved 26 August 2013. ^ "Accident description 52-1062. "Aviation Safety Network, 2018. Retrieved 10 July 2018. ^ "Crash of a Douglas C-124A-DL Globemaster II at McChord AFB: 18 killed". Bureau of Aircraft Accidents Archives. Retrieved 16 January 2018. ^ Ranter, Harro and Fabian I. Lujan. "ASN Aircraft accident Douglas C-124C Globemaster II 52-0968 Hawaii." Aviation Safety Network, 2009. Retrieved 28 June 2011. ^ "Crash of a Douglas C-124 Globemaster II in Greece: 10 killed". Bureau of Aircraft Accidents Archives. Retrieved 16 January 2018. ^ "Shadow box". airforce.togetherweserved.com. Retrieved 9 July 2017. ^ "Crash of a Douglas C-124 Globemaster II in Spain: 8 killed". Bureau of Aircraft Accidents Archives. Retrieved 16 January 2018. ^ "Accident description 51-5178." Aviation Safety Network, 2009. Retrieved 20 May 2011. ^ "Crash of a Douglas C-124 Globemaster II in Cold Bay: 7 killed". Bureau of Aircraft Accidents Archives. Retrieved 16 January 2018. ^ "Crash of a Douglas C-124 Globemaster II in Paramaribo: 11 killed". Bureau of Aircraft Accidents Archives. Retrieved 16 January 2018. ^ Weeks, John A. "C-124C Globemaster II". John A. Weeks III. Retrieved 14 November 2016. ^ "C-124A Globemaster II". Air Mobility Command Museum. AMC Museum Foundation, Inc. Retrieved 14 November 2016. ^ "C-124C "Globemaster II"". Museum of Aviation. Retrieved 14 November 2016. ^ "Aircraft N86599 Data". Airport-Data.com. Airport-Data.com. Retrieved 14 November 2016. ^ "DOUGLAS C-124C GLOBEMASTER II". McChord Air Museum. The McChord Air Museum Foundation. Retrieved 14 November 2016. ^ Veronico, Nick. "Outdoor Exhibits – C-124C "Globemaster II"". Travis Air Force Base Heritage Center. Travis Heritage Center. Retrieved 14 November 2016. ^ "GLOBEMASTER II". Pima Air & Space Museum. Pimaair.org. Retrieved 14 November 2016. ^ "Douglas C-124 Globemaster II". National Museum of the US Air Force. 21 July 2015. Retrieved 14 November 2016. ^ "Airframe Dossier – DouglasDC-7 Seven Seas / C-74 Globemaster I / C-124 Globemaster II, s/n 52-1072 USAF". Aerial Visuals. AerialVisuals.ca. Retrieved 14 November 2016. ^ "C-124C "Globemaster II"". Hill Air Force Base. 23 September 2010. Retrieved 14 November 2016. Wikimedia Commons has media related to Douglas C-124 Globemaster II. This page was last edited on 20 February 2019, at 14:46 (UTC).